Water UCI, a campus-wide initiative designed to build a community around water and collaborate on scientific questions relating to technology, management and policy, held an event featuring distinguished scholar-in-residence Aaron T. Wolf on March 3. Wolf is a Ph.D professor from Oregon State University who specializes in international water conflict resolution as well as geography and environmental science. He has served as a consultant for the US Department of State, US Agency for International Development and has authored many influential books. 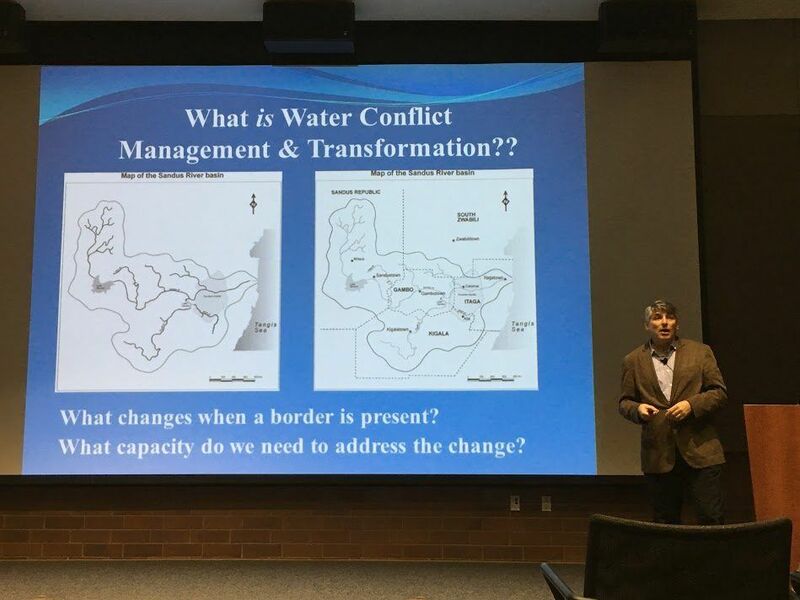 Dr. Wolf’s lecture, titled “Healing the Enlightenment Rift: Rationality, Spirituality & Shared Waters,” focused on the statistics of water conflict, different methods of facilitation, mediation and studying conflict and anger solutions across different faith traditions around the world. Many have predicted that wars in the 21st century will be fought over water resources, but Dr. Wolf gave evidence as to why this has not been the case so far. He explained that, contrary to popular belief, there have been tensions, but no military or political violence over water in the area. Wolf and his team examined all instances of two countries making agreements or decisions over water from the past 60 years. He continued to say that about 80 percent of conflict was solely verbal conflict, mostly arising from politicians trying to sell news of conflict to the media. “Although these conflicts result in tension, threats and unappealing scenarios, our record overwhelmingly shows that we get along,” he concluded. A main factor in getting groups to agree is making them realize that, no matter their differences, people always have a common interest. “No matter what the situation you are in, no matter whatever or whoever you are, you share something,” Wolf argued. Dr. Wolf has also studied the ancient Jewish Kabbalah of Conflict of divine consciousness, which focuses on three spheres of understanding: Din holds justice and self, which relates to laws, rules and our private lives; Chesed, which is mercy, community and spirituality; and Rachamim which means compassion. Wolf noted that these concepts are universal. In terms of putting these concepts into practice for water conflict resolution, he explains that in the rest of the world the three spheres are balanced. “In the ‘enlightened west’ we resolve conflicts by mainly focusing on justice; we lock people up and put away the key.” In other countries, conflict is treated as a community issue, and spirituality is always a component of their resolution. Wolf says that all humans are connected through the necessity and human right of having access to water. Water is used for physical needs and survival, religious ceremonies and spiritual needs and also economic goods such as irrigation, dams and industrial agriculture. Although water conflict is often manifested as a political issue, it is much more than that. “Science is a great place to start, but it’s not the whole story,” said Wolf. He concluded by reminding audience members to be tolerant and open minded when reasoning with one another.